Today we had out first customer of the season, well sort of. A car stopped at the farm and asked if we were the lavender farm. Shari said we were and the woman asked if we had any lavender plants for sale. Shari pointed to our new hoop house and told her that we didn't this year but hopefully next year we would have a variety of plants she could choose from. She then asked if we had "French" lavender. So many people have asked for English lavender or French lavender and we have to explain there isn't truly just a "French" lavender or an "English" lavender. 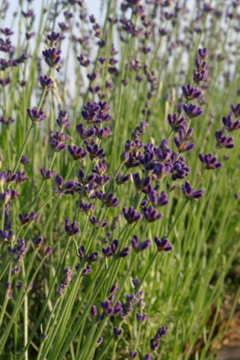 Most lavenders today are the offspring of the original lavender that grew wild in the hills of Provence. Growers in England, France and the United States have created varieties of lavender that favor a certain color, a certain trait or certain scent. Some will weather our winters and others will not. Shari mentioned she should come back in a few weeks when our lavender is in bloom and see what varieties she might like so next year she would know what lavender to buy. Being a lavender grower is part salesperson, part educator and part spokesperson for this wonderful perennial.